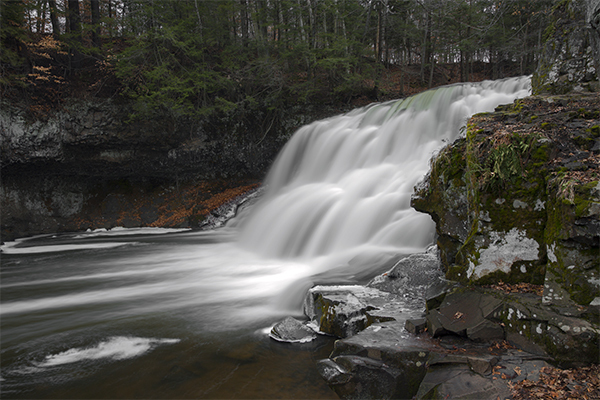 One of the highest volume undammed waterfalls in New England, Wadsworth Big Falls is one of two notable falls within Wadsworth Falls State Park. Wider than it is tall, Wadsworth Big Falls is a stereotypical block-type waterfall. 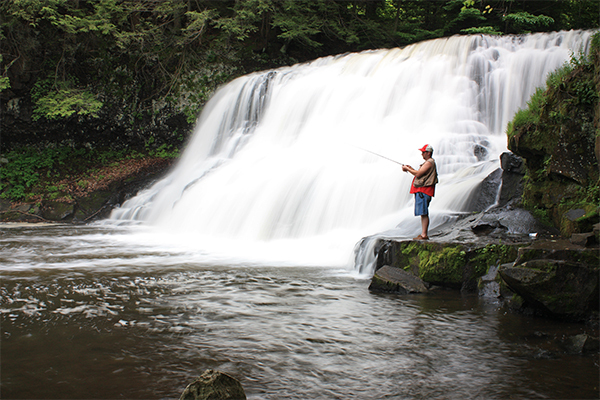 This falls earns its relatively high rating simply because you do not expect to find such a commanding waterfall in the heart of Connecticut. The currents of this river are astonishing given its location. Privacy should not be expected at this particular waterfall. The parking lot can begin to fill up, even on chilly, rainy days in the springtime. Its popularity can only be explained by its stunning volume and scale, especially considering how confined the area is. If seclusion and privacy is what you want, nearby Wadsworth Little Falls is there to fill your need; it’s only a 0.5 mile walk away and accessed by a trail that starts at the same parking lot as the Big Falls.